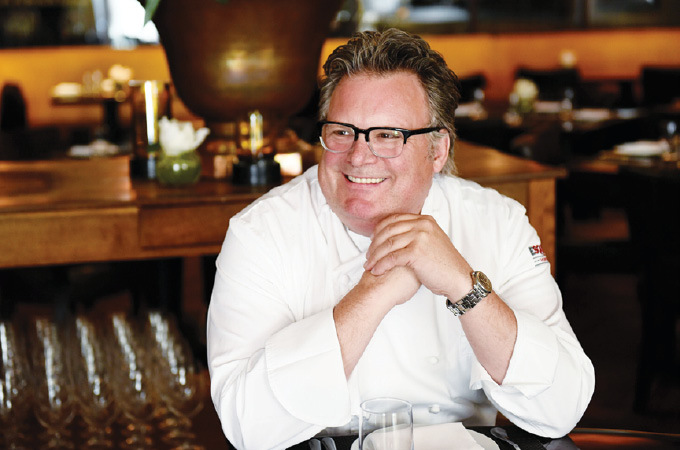 If the name David Burke rings a bell, it shouldn’t come as a surprise. You may have caught his appearances on Iron Chef America and Top Chef Masters, or maybe you’ve dined at one of his acclaimed restaurants—he has had several across the country, from New York to Las Vegas. 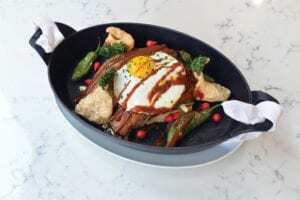 His latest venture, Grand Tavern by David Burke, has brought him to the StL, and the celebrity chef is excited to make his mark on our city. When he was growing up in New Jersey, cooking wasn’t one of Burke’s hobbies. Thanks to a simple, restricted diet at home, he didn’t have much interest in food at all, actually. “My father was a health nut, so we didn’t keep soda, sweets or processed food in the house,” he recalls. “I grew up on brown bread and skim milk. It’s trendy now, but believe me, as a kid in the ’70s, I wasn’t happy.” His passion for the culinary arts and hospitality sparked around age 15 when he got a job as a dishwasher in a busy hotel kitchen. “I fell in love with the energy, camaraderie, creativity and instant gratification you have from a successful day at a restaurant,” he says. Once he decided to pursue cooking as a career, Burke chose to study at the highly regarded Culinary Institute of America and says the experience was a mix of excitement, discipline, fear and respect. “I was a kid who wanted to be a chef going to the best culinary school in the world, and I’ve carried that energy with me my entire career,” he notes. “It was an incredible learning experience.” After gaining recognition as a sous chef, Burke decided to challenge himself further by tackling pastry school. He attended Ecole Lenôtre in Paris and remembers it fondly. “I was like a kid in a pastry shop,” he jokes. 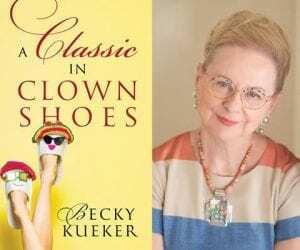 The experiences at both culinary institutions carried Burke into his incredibly successful career. Among the highlights is receiving the prestigious Meilleurs Ouvriers de France Diplôme d’Honneur for skill and creativity with his native cuisine at the International Culinary Competition in Japan. “I was chosen to represent the U.S., and that had a profound impact on me,” he recalls. “I was 26, and even though no one expected it, I had the energy and adrenaline to win.” He adds that while no one award is more important than another, he found it gratifying to be honored by his peers and represent his country. Along with competitions, Burke’s energy has allowed him to be successful in the demanding restaurant world. He first opened Park Avenue Café with Alan Stillman in 1992, and in 2002, he branched out to his first proprietary venue, Davidburke & Donatella. Since then, he’s been behind more than a dozen innovative restaurant concepts. Even with experience and talent, he notes that opening restaurants is among the most difficult things he’s ever done. “When you’re young, you worry about every detail and get frustrated when something doesn’t go perfectly,” he says. “As I’ve gotten older, I don’t sweat the little stuff as much.” His growing team has allowed him to delegate more responsibilities, but he finds the excitement of a restaurant debut never changes. When developing the concept for Grand Tavern, Burke says he was impressed by the variety of St. Louis’ culinary scene. “There are some really talented people cooking and a lot of enthusiasm,” he notes. “Because it’s a new spot, I think people who come to Grand Tavern will expect creativity and something different, and we’ll give it to them.” The executive chef is Robert Cantu, and Burke says the restaurant builds off their shared experience and knowledge to deliver the whole package. Burke himself developed the menu and notes that how he approaches food may be a little different. “Food actually approaches me,” he jokes, adding that his first priority is respecting ingredients. “I source the best products, work with the season, and do my best to stay ahead of the curve and create trends. I want to give people great value, great taste, great visuals and a great experience, all on one plate. >> Combine all ingredients for the Moroccan BBQ sauce and simmer for 45 min. >> Cook the mushrooms in the butter. When softened, add the spinach, pasta and cheese sauce. >> Warm the brisket in the oven and baste with the BBQ sauce. Toast the brioche; cook the egg to your liking. >> Pour the noodle mixture on the brioche and top with brisket, sauce and egg. Garnish with peppers.